When the “old” Message is spoken of in readers’ circles, this refers to the “large edition” of 1931, the “Reverberations of the Grail Message” Volume I, published in 1934, and the individual lectures that were published up to the end of 1937 (partly in the periodical “The Voice”). 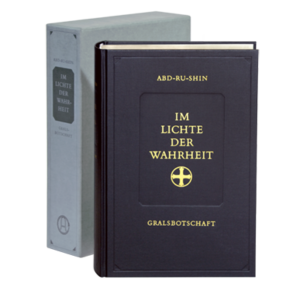 They are presented in opposition to the Grail Message “In the Light of Truth” Volumes I, II, and III, – the “Final Authorised Edition”. In so doing, the Grail Message “In the Light of Truth”, the large edition of 1931, is often referred to as the “actual” Message or the original version. The impression is created that this edition of 1931 to some degree came down “complete from heaven”, “ while the “final authorised edition” is depicted as a revision, which also give rises to doubts, as to whether Abd-ru-shin himself undertook this revision. It is not seen or known that also the “large edition” of 1931, like the later “final authorised edition”, retraces a development. For this “large edition”, in comparison to the “small edition” of 1926, Abd-ru-shin had also changed the sequence of the lectures, added new lectures and made editorial revisions (for example, spelling and repetitions). In the epilogue to the “large edition” of 1931, Abd-ru-shin declared the recognition of his spiritual origin and the help for mankind connected with this. Also, when he wrote that he, Abd-ru-shin, had now completed his Message to mankind, this certainly did not say that he had nothing more to say to mankind, for he indeed wrote many more lectures subsequently. However, with the content of the lectures in this form he had provided the basis for mankind of that time, enabling them to recognise in the Grail Message the help from the Creator for mankind. Only with this were they in a position to understand and make use of the further explanations that followed in the form of “Reverberations to the Grail Message”. Also, the statement from the epilogue, “How the Message is to be absorbed” (“Reverberations of the Grail Message” Volume 1) “… you must leave my Message unchanged …” is often used as an argument to “prove” that this edition was not to be changed. However, this advice concerns only us, as hearers and readers, not, however, the author himself. He, as the Bringer of the Grail Message, could quite naturally change its form. Understanding and realisation of the Message from the Grail became ever more difficult for people in the course of the following years. History shows that the large majority of people chose different ways from those shown in the Grail Message − however not only the majority of people in general, but also some confessors of the Grail Message, who had already recognised it as an existential guide. Already in the year 1937, Abd-ru-shin mentioned to some of his intimates that that development made revision of his lectures necessary, as it emerged from letters and explanations of these individuals. Abd-ru-shin undertook this revision during his forced sojourn in Kipsdorf. At that time, it was possible in spite of great difficulties for a few adherents of the Grail Message to visit Abd-ru-shin and his family there. He spoke to them about the revision of his lectures and explained that he had compiled the Message in three parts. Some of these people later documented the memories of these visits in declarations or letters. It is probably hardly conceivable how much Abd-ru-shin may have suffered under the conditions of his exile. The inner tensions and burdens as a result of being restricted in his activities also took their physical toll. During a hospital stay in November 1941 the doctors could not diagnose any physical causes and gave in to the wish of the patient to return “home” to Kipsdorf. Abd-ru-shin passed on there from this earth in the afternoon of 6 December 1941. His wish to return home strove towards a goal that lay at heavenly distances above this earth. After Abd-ru-shin had passed away, Maria and Irmingard Bernhardt continued his work. They had to endure war years filled with suffering until they could return to Abd-ru-shin’s earthly domain on Vomperberg after the end of the war in 1945. Sometime later, in a circular to adherents of the Grail Message, they disclosed that Abd-ru-shin had revised his Message during the years in Kipsdorf. Maria and Irmingard Bernhardt could not – as is occasionally insinuated – derive any benefit from the fact of the revision of the Grail Message. How much simpler it would have been for them both after the war simply to issue the “large edition” of 1931, the “Reverberations to the Grail Message” of 1934 and the individual lectures that had appeared up to 1937 in this “old” form! They could have spared themselves much effort, trouble, hostility and also costs. Only the assurance of the wish to fulfil the Will of Abd-ru-shin and to spread his Message as he himself had finally determined, were the basis for their actions.